The frame uses our new Optimised For Inline frame layout which was developed for the Soul275 but with a 1 deg slacker head angle for a given fork travel. For example, where the Soul275 has a 69 deg head angle with a 120mm fork at ride height, the BFe275 is 68 deg. Once you're up to 150mm forks the BFe275 the head angle is 66.8deg so it's a little more like a hardtail Rocket, and rightly so. This is one fast bike! The BFe has always been the hooligan of the range, and now in giving the BFe unique geometry we're turning that up to 11 with a proper little riot machine. It's available to pre-order now for delivery in early May. There is the matte green you see up there, or matte blue as seen on the Soul275. 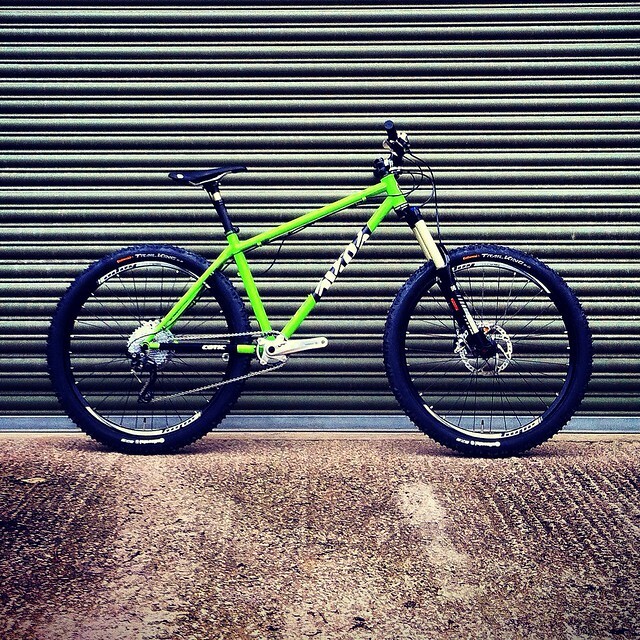 The new BFe275 is £349 for the frame, and the complete bike starts at £2,000.